THE PICKIEST EATER IN THE WORLD: QUICK PICK: ZARK'S BURGER'S JAWBREAKER!!! 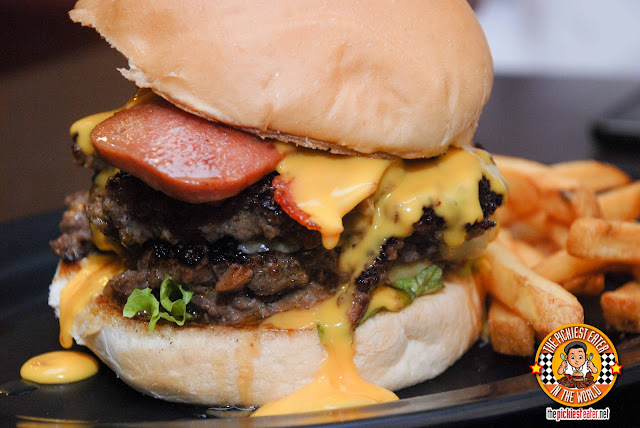 QUICK PICK: ZARK'S BURGER'S JAWBREAKER!!! In case you guys needed any more motivation to go to Zark's Burger's Jawbreaker Day On March 17, 2013 at their Taft Avenue Branch, here's a short video that will definitely convince you! If you've seen the Jawbreaker in person, you know that it is truly a sight to behold. But now I take you behind the scenes, and into Zark's Burger's Kitchen, for a short glimpse of how the triple patty behemoth is made! Feast your eyes on the JAWBREAKER! In case you haven't joined my giveaway for 5 tickets to Jawbreaker Day 8, happening on March 17, 2013 at the Taft Avenue Branch in One Archer's Nook, Click on the link below for more info on how to join! JAWBREAKER DAY 8 TICKET GIVEAWAY! For the meantime, you can check out my youtube channel! McCORMICK GRILL NATION ON APRIL 7! BEST FOOD FORWARD YEAR THREE! THE SECOND BURGER AVENUE GIVEAWAY! WHAT ABOUT BREAKFAST AT CAFE 1771? EARLY BIRD BREAKFAST CLUB GIVEAWAY WINNERS! ZARKS BURGERS JAWBREAKER DAY 8 TICKET WINNERS! EARLY BIRD BREAKFAST CLUB GIVEAWAY!